Hearty and loaded with good stuff, this seductive vegan gluten free salad satisfies as a meal or a side. Preheat the oven to 400°F. Halve the squash lengthwise, remove and discard the seeds and membrane, and cut the squash into 1-inch-thick wedges. Transfer the wedges to a baking sheet, drizzle with olive oil, sprinkle with 1/4 teaspoon salt, a few grindings of pepper, the coriander, and 1/4 teaspoon of the cumin. Toss to coat. Bake until tender and lightly browned, about 30 minutes. Set aside. Bring a medium pot of water to a boil. Salt generously, add the lentils, and cook until soft but still a little toothsome, 15 to 20 minutes. Drain, then spread them on a plate. Set aside. Set out a large piece of parchment paper. In a dry sauté pan over medium heat, toast the pumpkin seeds, stirring frequently, until fragrant, about 5 minutes. Add the sugar, the remaining 1/8 teaspoon cumin, the chili powder, and a generous pinch of salt. Stir until the sugar is melted and coats the pumpkin seeds. Spread the seeds on the parchment paper and let cool. In a large bowl, combine the lentils, greens, mustard, and a drizzle of olive oil and toss to coat. 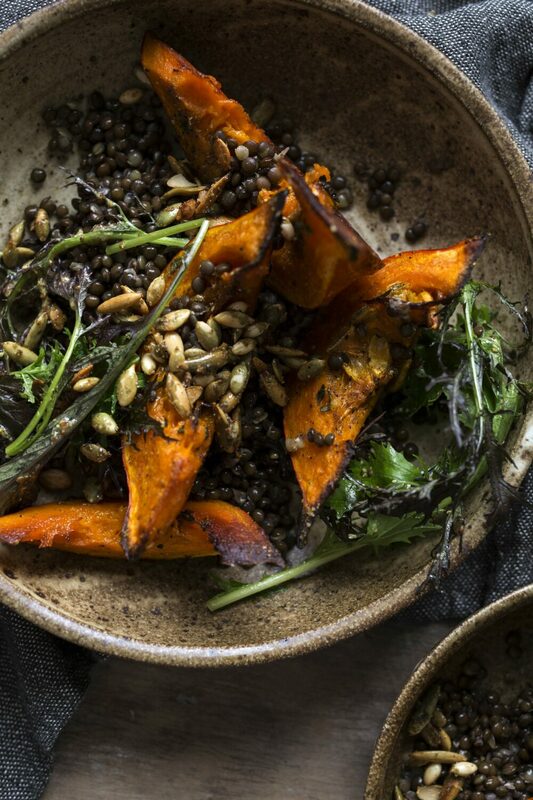 Transfer to a platter, top with the roasted squash and pumpkin seeds, and serve.